To help you navigate the wealth of consumer health information out there effectively and safely, the MCW Libraries have created lists of reliable, trusted resources you can turn to as well as tips and tricks to evaluate health information. A lot of misleading health information is published in books and magazines and featured on TV and the web. It's important to get health information from trusted resources. 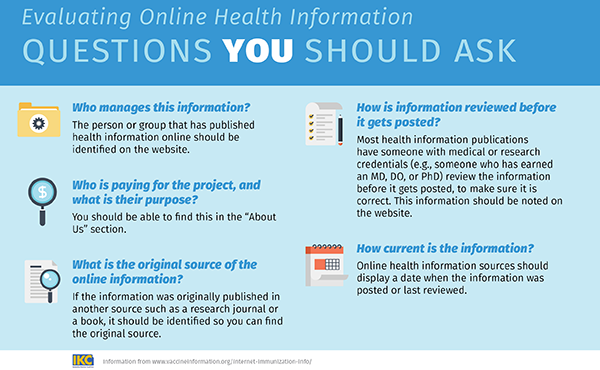 When reading health information, it's also helpful to ask yourself questions about the source of the health information. Graphic designed by Immunize Kansas Coalition. Medline Plus's collection of reliable resources for evaluating health information. Click on "Start the Tutorial" to watch the National Library of Medicine's video on evaluating health information. The National Cancer Institute's guide to evaluating health information.